The intestinal epithelium forms a physical barrier to limit access of enteric microbes to the host and contributes to innate host defense by producing effector molecules against luminal microbes. To further define the role of the intestinal epithelium in antimicrobial host defense, we analyzed the expression, regulation, and production of two antimicrobial peptides, human defensins hBD-1 and hBD-2, by human intestinal epithelial cells in vitro and in vivo. The human colon epithelial cell lines HT-29 and Caco-2 constitutively express hBD-1 mRNA and protein but not hBD-2. However, hBD-2 expression is rapidly induced by IL-1α stimulation or infection of those cells with enteroinvasive bacteria. Moreover, hBD-2 functions as a NF-κB target gene in the intestinal epithelium as blocking NF-κB activation inhibits the up-regulated expression of hBD-2 in response to IL-1α stimulation or bacterial infection. Caco-2 cells produce two hBD-1 isoforms and a hBD-2 peptide larger in size than previously described hBD-2 isoforms. Paralleling the in vitro findings, human fetal intestinal xenografts constitutively express hBD-1, but not hBD-2, and hBD-2 expression, but not hBD-1, is up-regulated in xenografts infected intraluminally with Salmonella. hBD-1 is expressed by the epithelium of normal human colon and small intestine, with a similar pattern of expression in inflamed colon. In contrast, there is little hBD-2 expression by the epithelium of normal colon, but abundant hBD-2 expression by the epithelium of inflamed colon. hBD-1 and hBD-2 may be integral components of epithelial innate immunity in the intestine, with each occupying a distinct functional niche in intestinal mucosal defense. Defensins are cationic, cysteine-rich antimicrobial peptide components of the mammalian innate immune system (1). Human α-defensins, namely human neutrophil defensins 1–4 (1, 2) as well as human defensin (HD)4-5 and HD-6 in small-intestinal Paneth cells and the female genital tract, are known mediators of antimicrobial defense (1, 3, 4, 5, 6). Less well defined, however, is the distribution and function of two more recently described members of the defensin family, the human β-defensins hBD-1 and hBD-2 (7, 8), that are predominately expressed at epithelial sites. hBD-1 is constitutively expressed in respiratory tract, kidney, and urogenital epithelium (9, 10, 11, 12, 13) and by epithelia in the oral cavity (14, 15), whereas hBD-2 has been identified in the skin (8, 16, 17), respiratory (12, 18, 19), and gingival epithelium (15). RNA dot-blot screening of a human tissue panel has also provided evidence for gastrointestinal expression of hBD-2 mRNA in stomach, small intestine, and colon (18). At least six hBD-1 isoforms that range in length from 36 to 47 amino acids, and differ in their microbicidal activity, have been identified in urine (13). A single isoform of hBD-2, 41 aa in length, has been isolated from respiratory epithelial secretions and saliva (12, 15, 18). Purified and recombinant forms of the β-defensins in urine and lung epithelial secretions exhibit antimicrobial activity in vitro against several respiratory, genitourinary tract, and enteric bacteria, including Pseudomonas, Escherichia coli, and Salmonella (14, 18). Unlike hBD-1, which is produced constitutively, hBD-2 in respiratory tract epithelial cells and epidermal and gingival keratinocytes is expressed in response to bacterial infection or proinflammatory agonists, suggesting a role for this β-defensin in epithelial host defense under those conditions (8, 12, 16, 17, 18, 19). The regulated expression of hBD-2 is consistent with that described for other mammalian β-defensins. For example, in bovine and murine models, the expression of a number of epithelial β-defensins, namely bovine enteric β-defensin in colon crypt epithelium, tracheal antimicrobial peptide and lingual antimicrobial peptide in bovine tracheal and lingual epithelium, and murine β-defensin (mBD) 3 and Defb2 in respiratory epithelium, are induced or up-regulated as part of the inflammatory response (20, 21, 22, 23, 24, 25). Despite recent information regarding the expression of β-defensins at other mucosal sites, little is known about the constitutive or regulated expression of these peptides in the human intestinal tract. The single-cell layer of epithelium that separates intestinal luminal contents from the internal milieu of the host is important for innate host defense by maintaining mucosal barrier function and in the production of an array of proinflammatory immune mediators. These include cytokines and chemokines, NO, and PGs that, together, have the potential to rapidly signal and regulate a coordinated mucosal inflammatory response to microbial infection (26, 27, 28, 29, 30, 31, 32, 33, 34, 35, 36). Peptide antibiotics, such as the β-defensins, also may contribute to host defense in the microbe-rich environment of the intestinal tract. As a first step in testing this hypothesis, we applied in vitro and in vivo model systems to determine the expression, regulation, and production of hBD-1 and hBD-2 by human intestinal epithelium. The human colon epithelial cell lines Caco-2 and HT-29 (26) were cultured in DMEM, supplemented with 10% FBS and 2 mM l-glutamine, and then maintained at 37°C in 5% CO2 and 95% air. Recombinant human (rh) IL-1α, rhIFN-γ, and rhTNF-α were obtained from Peprotech (Rocky Hill, NJ). Bacterial LPS (E. coli O111:B4) and the proteasome inhibitor MG-132 were obtained from Sigma (St. Louis, MO). 12-O-Tetradecanoylphorbol-13-acetate (TPA) was obtained from Calbiochem (La Jolla, CA). The following bacteria were used: Salmonella dublin lane (27), an attenuated aroA aroC strain of Salmonella typhi (28), and enteroinvasive E. coli (serotype O29:NM; no. 43892, American Type Culture Collection, Manassas, VA) (27). Caco-2 and HT-29 cells in 6- or 12-well tissue culture plates (Corning-Costar, Cambridge, MA) were stimulated for 1 h with rhIL-1α (20 ng/ml), rhTNF-α (20 ng/ml), rhIFN-γ (40 ng/ml), or LPS (10 μg/ml), after which culture medium was removed and replaced with fresh medium. For bacterial infection, cells were cultured for 1 h with 1 × 108 bacteria/well, after which bacteria were removed by washing, and 50 μg/ml of gentamicin was added to kill any remaining extracellular bacteria, as described before (27). Supernatants and cells from agonist-stimulated and bacterially infected cultures were harvested following an additional 5–6 h incubation. Cells were used for RNA extraction, and supernatants were stored at –80°C until use. The human intestinal xenograft model used herein has been described in detail before (28, 29, 31, 32, 37, 38). Briefly, human fetal intestine (gestation age, 10–14 wk) was transplanted s.c. into CB-17 SCID mice, and xenografts were allowed to develop for 10 wk before use. Xenografts were infected with ∼5 × 107 of attenuated aroA aroC S. typhi in DMEM/F12 medium in a 100-μl volume injected intraluminally by s.c. injection. Xenograft tissue was removed 6 h after infection, and mucosal scrapings were prepared and immediately frozen in liquid nitrogen. Recombinant adenovirus containing an IκBα-AA superrepressor (Ad5IκB-A32/36) or the E. coli β-galactosidase gene (Ad5LacZ) was constructed as described before (36, 39). Ad5IκB-A32/36 expresses a hemagglutinin epitope-tagged mutant form of IκBα in which serine residues 32 and 36 are replaced by alanine residues (36, 39). The mutant IκBα cannot be phosphorylated at positions 32 and 36 and acts as a superrepressor of NF-κB activation (36, 39). Caco-2 and HT-29 epithelial cells grown to confluence in six-well tissue culture plates were infected with Ad5IκB-A32/36 or Ad5LacZ in serum-free medium (Opti-MEM; Life Technologies, Grand Island, NY) at a multiplicity of infection (MOI) of 75 for 16 h. At this MOI, Ad5IκB-A32/36 or Ad5LacZ infected >80% of the cells. Infected cells expressed IκBα-A32/36 and β-galactosidase at high levels as assessed by staining for β-galactosidase and immunostaining for hemagglutinin-tagged IκB-A32/36. After infection, adenovirus was removed by washing, fresh medium containing serum was added, and cells were incubated for an additional 12 h before bacterial infection or IL-1α stimulation. The IκBα-AA superrepressor inhibited NF-κB activation in HT-29 and Caco-2 cells, as assessed by EMSA, and inhibited TNF-α-induced up-regulation of IL-8 and ICAM-1 expression in HT-29 cells but did not alter β-actin mRNA levels in the same cells (Ref. 36 and data not shown). Total cellular RNA was extracted from cell lines and xenograft tissue using TRIzol reagent (Life Technologies). RNA (1 μg) was reverse transcribed at 37°C (Life Technologies Superscript kit) with 1 mM each of dATP, dTTP, dCTP, and dGTP and 5 μg/ml of oligo-dT primer in a 20-μl volume as described before (30). Two microliters of each cDNA sample from the reverse transcription reactions was amplified as described before (30), with 4.0 U Taq polymerase (Life Technologies) in a 50-μl volume containing 25 pmol each of the following primers: 5′-CTC TGT CAG CTC AGC CTC-3′ (sense) and 5′-CTT GCA GCA CTT GGC CTT CCC-3′ (antisense) for hBD-1, 5′-CCA GCC ATC AGC CAT GAG GGT-3′ (sense) and 5′-GGA GCC CTT TCT GAA TCC GCA-3′ (antisense) for hBD-2, 5′-CCC AGC CAT GAG GAC CAT CG-3′ (sense) and 5′-TCT ATC TAG GAA GCT CAG CG-3′ (antisense) for HD-5, and 5′-CCA CTC AAG CTG AGG ATG ATC-3′ (sense) and 5′-TGA TGG CAA TGT ATG GGA CAC ACA C-3′ (antisense) for HD-6 (5). β-Actin primers were as described before (30). After a hot start, the amplification profile was 35 cycles of 1-min denaturation at 94°C, 1-min annealing at 66°C, and a 1.5-min extension at 72°C. The same amplification profile was used for β-actin. PCR products were resolved on 1.5% agarose gels (Life Technologies). RT-PCR amplification of hBD-1 and hBD-2 generated products of 272 and 254 bp, respectively. The strategy for quantitative RT-PCR analysis using internal standard RNAs and the construct for the quantitation of human β-actin mRNA were described before (28). For the quantitation of hBD-1 and hBD-2, a plasmid construct was developed incorporating 5′ and 3′ primer sites for hBD-1 and hBD-2 separated by an intervening insert of the mouse Ig α constant region (28). Briefly, a 260-bp fragment of a mouse CHα cDNA clone was amplified with the primers 5′-CCA GCC ATC AGC CAT GAG GGT GAA CAG TGG CGC ATC ATT CAA GTC-3′ (sense) and 5′-CTT GCA GCA CTT GGC CTT CCC GCA ACA CGC TTG TCA CCA GGT AGG-3′ (antisense). Regions corresponding to mouse CHα are underlined. The resulting product was further PCR amplified using the primers 5′-CGA AGC AAG CTT CTC GTC AGC TCA GCC CCC AGC CAT CAG CCA TGA GGG T-3′ (sense) and 5′-CGA AGC TCT AGA GGA GCC CTT TCT GAA TCC GCA CTT GCA GCA CTT GGC CTT CCC-3′ (antisense). HindIII (sense primer) and XbaI (antisense primer) restriction sites are underlined. The resulting PCR product was ligated into the XbaI and HindIII sites of plasmid pBATNOT, which contains a promoter for T7 RNA polymerase upstream and a d(pA)16 sequence and a NotI restriction site downstream of the cloned fragment. Plasmid linearized using NotI was in vitro transcribed using T7 RNA polymerase (T7 polymerase kit, Life Technologies) to yield a 430-nt standard RNA. Numbers of standard RNA transcripts were calculated on the basis of the RNA concentration and the size of the standard RNA as described before (28). For quantitation, known amounts of standard RNA transcripts were added to constant amounts of cellular RNA as described before (30). cDNA from the standard RNA transcripts included in quantitative RT-PCR yielded fragments of 368 bp for hBD-1 and 371 bp for hBD-2. hBD-1 or hBD-2 mRNAs were regarded as not expressed when PCR amplification yielded no product or <103 transcripts/μg cellular RNA, because the latter are not likely to be paralleled by biologically meaningful protein production (i.e., because 105 cells yield ∼1 μg cellular RNA, 103 transcripts/μg cellular RNA is equivalent on average to ∼1 transcript per 100 cells). Supernatants were harvested from unstimulated or IL-1α-stimulated HT-29 cells after 6 h incubation. Cationic peptides from cell-culture supernatants were extracted using the weak cation exchange matrix MacroPrep CM (carboxymethyl) support (Bio-Rad Laboratories, Hercules, CA). Briefly, matrix MacroPrep CM was added to the culture supernatant at a v/v ratio of 1:75, incubated overnight at 4°C with stirring, sedimented at 1000 × g for 5 min, and washed three times for 5 min with 100 volumes of 25 mM ammonium acetate (pH 6.8). Peptides bound to the matrix were eluted with four matrix volumes of 10% acetic acid for 30 min, followed by subsequent elutions with 5% acetic acid. Acetic acid eluates were pooled, and aliquots were lyophilized before electrophoresis on acetic acid urea gels and immunoblot analysis, as described before (13). The transfer time was 20 min with fixation in a formalin vapor chamber for 20 min. 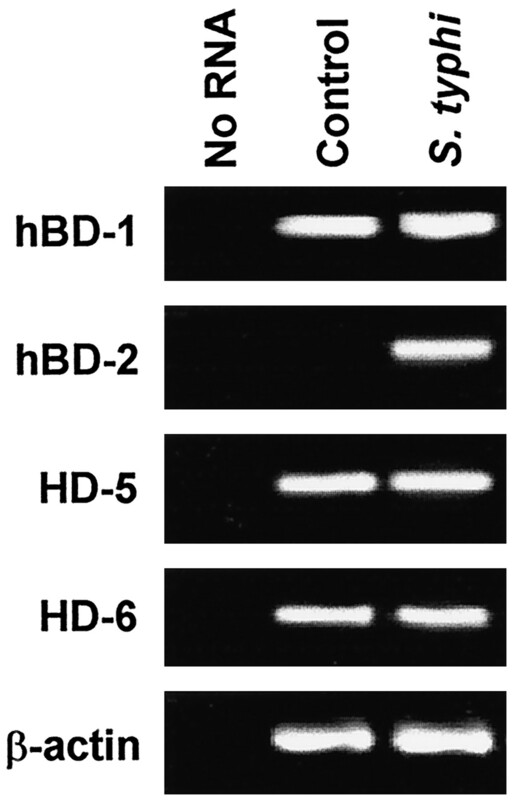 Blots were developed using a 1:1000 dilution of polyclonal rabbit anti-hBD-1 or hBD-2 (12, 13, 15) as primary Ab, alkaline phosphatase-conjugated goat anti-rabbit IgG as secondary Ab, and bromochloroindolyl phosphate/nitroblue tetrazolium as substrate as described before (13). rhBD-1 and rhBD-2 peptides were used as standards (12, 13, 15). Human colon and small-intestinal mucosa from individuals undergoing partial colectomy, small bowel resection, or colon or small bowel endoscopic biopsy was embedded in OCT compound and snap-frozen in isopentane/dry ice. Cryostat sections (5 μm) were air dried, fixed with 4% paraformaldehyde, and then blocked with 0.1 M glycine. Sections were overlaid for 1 h with a 1:1000 dilution of rabbit antisera to hBD-1 or hBD-2 (13, 15) or an identical concentration of control preimmune sera from the same rabbits, after which endogenous biotin was blocked (Avidin/Biotin Blocking Kit; Zymed, South San Francisco, CA). Specific binding of rabbit IgG was detected using the LSAB 2 kit against primary rabbit IgG (Dako, Carpinteria, CA) according to the manufacturer’s instructions and streptavidin-Cy3 to visualize specific binding. To determine whether human colon epithelial cell lines constitutively express β-defensins, RNA from unstimulated Caco-2 and HT-29 cells was analyzed by RT-PCR using hBD-1- and hBD-2-specific primers. As shown in Fig. 1⇓, Caco-2 and HT-29 cells constitutively expressed mRNA for hBD-1, whereas there was little if any constitutive expression of hBD-2 mRNA. hBD-1 transcript levels in the cell lines ranged from 105 to 106 transcripts/μg cellular RNA in three repeated experiments as assessed by quantitative RT-PCR. hBD-1 mRNA is constitutively expressed by colon epithelial cells, whereas expression of hBD-2 mRNA is up-regulated by IL-1 and enteroinvasive bacteria. 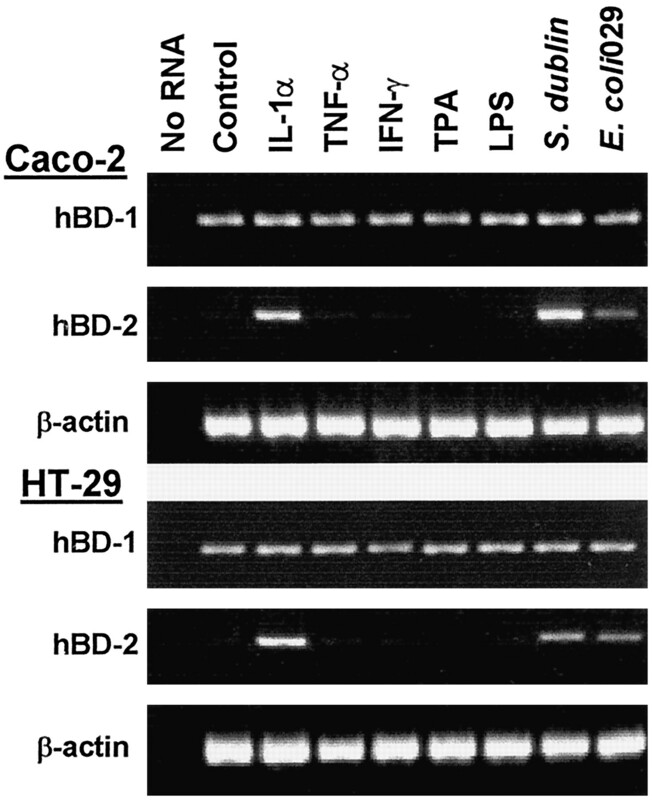 RNA from Caco-2 and HT-29 cells was amplified by RT-PCR with primers specific for hBD-1, hBD-2, and β-actin as detailed in Materials and Methods. The first lane contains no RNA. PCR products from control Caco-2 and HT-29 cells left untreated are shown in the second lane, and those from cells following stimulation with optimal concentrations of agonist or bacterial infection are as follows: IL-1α stimulated (20 ng/ml), TNF-α stimulated (20 ng/ml), IFN-γ stimulated (40 ng/ml), TPA stimulated (100 ng/ml), LPS stimulated (10 μg/ml), S. dublin infected, and E. coli O29:NM infected. hBD-1 mRNA expression was not up-regulated by stimulation of Caco-2 or HT-29 cells with IL-1α, TNF-α, IFN-γ, LPS, or TPA, or by infection of those cells with the enteroinvasive bacteria, S. dublin or enteroinvasive E. coli, as shown in Fig. 1⇑ and confirmed by quantitative RT-PCR. In contrast, hBD-2 mRNA expression was induced by stimulation of those cells with IL-1α or by infection with S. dublin or enteroinvasive E. coli. Maximal expression of hBD-2 mRNA occurred by 4–6 h after IL-1α stimulation or bacterial infection (peak expression ranged from 105 to 106 transcripts/μg cellular RNA in three repeated experiments), with transcript levels returning toward baseline by 8 h. TNF-α as well as IFN-γ, LPS, and TPA had little to no effect on hBD-2 expression (Fig. 1⇑). Neither cell line expressed mRNA for either human Paneth cell α-defensin, HD-5 or HD-6 (data not shown). To determine whether expression of hBD-1 and hBD-2 mRNA was paralleled by the production of those proteins, hBD-1 and hBD-2 were assayed in supernatants of unstimulated and IL-1α-stimulated Caco-2 cells by immunoblot analysis. Consistent with its constitutive mRNA expression, hBD-1 was present in culture supernatants from unstimulated Caco-2 cells (Fig. 2⇓). 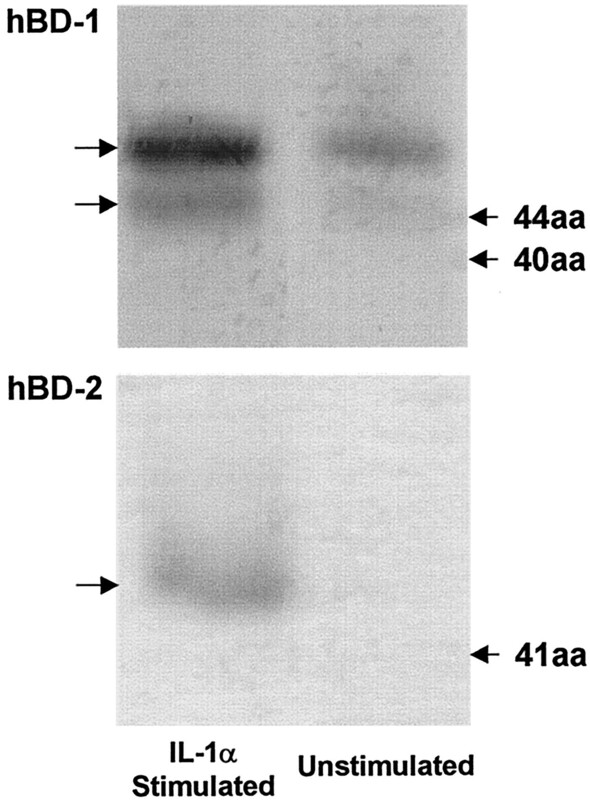 The hBD-1 isoforms produced by Caco-2 cells appeared to be 47 and 44 aa in length, as assessed by comparison with hBD-1 peptide standards resolved in parallel. In some, but not all, experiments, hBD-1 release into culture supernatants increased after IL-1α stimulation, as depicted in Fig. 2⇓. After 6 h, approximate hBD-1 concentrations in supernatants of unstimulated cells ranged from 10 to 15 ng/ml as determined by comparison with known amounts of hBD-1 standards run in parallel. We note this may underestimate the actual hBD-1 concentration in culture supernatants because of possible losses of protein in the isolation and preparative steps. Detection of hBD-1 and hBD-2 in culture supernatants from unstimulated and IL-1α-stimulated Caco-2 cells in the absence or presence of IL-1α. Cationic peptides from culture supernatants were subjected to electrophoresis on acetic acid urea gels, transferred to polyvinylidene difluoride membrane, probed with anti-hBD-1 (top) or anti-hBD-2 Abs (bottom), and developed with alkaline phosphatase conjugate. The positions of hBD-1 or hBD-2 standards of the indicated length in amino acids are depicted on the right of each panel. Specific staining is marked by arrows on the left. In contrast to hBD-1, hBD-2 was not detected in culture supernatants from unstimulated Caco-2 cells but was detected in culture supernatants from IL-1α-stimulated cells. A 41-aa isoform of hBD-2 has been identified in saliva, airway surface fluid, and bronchoalveolar lavage fluid (12, 15, 18). However, the hBD-2 isoform present in Caco-2 culture supernatants migrated somewhat more slowly than a known hBD-2 peptide standard of this size, suggesting a peptide larger than 41 aa (Fig. 2⇑). After 6 h, the approximate hBD-2 concentration in culture supernatants was 5 ng/ml. NF-κB has a key role in regulating the transcription of several members of a proinflammatory gene program in intestinal epithelial cells that is induced in response to inflammation or infection with enteroinvasive bacteria (e.g., IL-8, ICAM-1, inducible NO synthase, COX-2, and growth-related oncogene α) (26, 27, 28, 29, 30, 31, 32, 33, 34, 35, 36). The identification of a NF-κB consensus sequence in the proximal promoter of the hBD-2 gene (15, 16) suggested that hBD-2 might be a component of this epithelial NF-κB target gene program. Because IL-1, S. dublin, and enteroinvasive E. coli are known to activate NF-κB in intestinal epithelial cells (36, 39, 40), we assessed whether the IL-1 and bacterially induced expression of hBD-2 was mediated by an NF-κB-dependent mechanism. As shown in Fig. 3⇓A, inhibiting NF-κB activation in HT-29 and Caco-2 cells with a proteasome inhibitor, MG-132, or by infection with a recombinant adenovirus expressing an IκBα superrepressor (Ad5IκB-A32/36), completely blocked the IL-1α-induced expression of hBD-2 mRNA. Neither MG-132 nor the IκBα superrepressor affected hBD-1 or β-actin mRNA levels in those cells. To assess whether blocking NF-κB activation also abrogated the expression of hBD-2 in response to S. dublin or enteroinvasive E. coli infection, Caco-2 cells that were not infected with adenovirus and Caco-2 cells infected either with adenovirus expressing the IκBα superrepressor (Ad5IκBα-A32/36) or β-galactosidase (Ad5LacZ) were infected with S. dublin or enteroinvasive E. coli O29:NM. As shown in Fig. 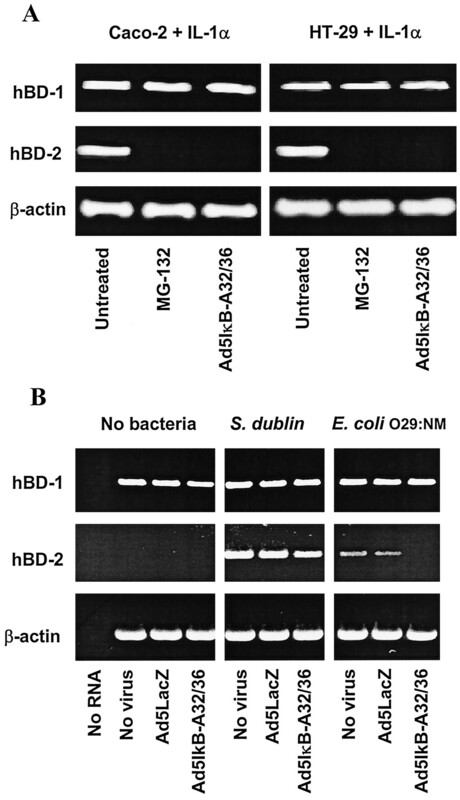 3⇓B, the S. dublin- and enteroinvasive E. coli-induced expression of hBD-2 mRNA was decreased in cells expressing the IκB superrepressor, but not in Ad5LacZ-infected cells, whereas hBD-1 and β-actin mRNA levels remained unchanged. Parallel results were obtained also using HT-29 cells (data not shown). hBD-2 is an NF-κB target gene. A, Caco-2 and HT-29 cells were either left untreated, treated with MG-132 (25 μM), or infected with 75 MOI of an adenovirus (Ad5IκB-A32/36) expressing an IκBα superrepressor before stimulation with IL-1α (20 ng/ml) for 6 h, after which RNA was extracted and amplified by RT-PCR with primers specific for hBD-1, hBD-2, and β-actin. B, Caco-2 cells were either left uninfected (no virus); infected with a control adenovirus, Ad5LacZ; or infected with Ad5IκB-A32/36, which expresses a mutant IκBα protein that acts as a superrepressor of NF-κB activation. Cultures then either were left uninfected (no bacteria) or were infected with S. dublin or enteroinvasive E. coli O29:NM. RNA was extracted and amplified by RT-PCR for hBD-1, hBD-2, and β-actin. Parallel results were obtained using HT-29 cells (not shown). The mucosa of human intestinal xenografts contains surface and crypt epithelium that is strictly of human origin (28, 29, 31, 32, 37, 38). 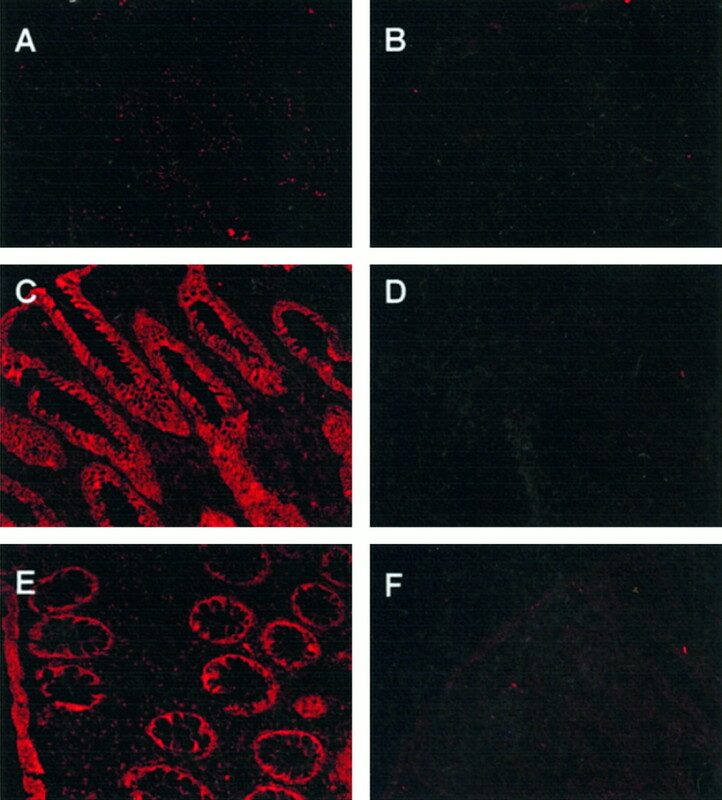 To confirm the in vitro data generated in colon epithelial cell lines in an in vivo infection model, human intestinal xenografts implanted s.c. on the backs of SCID mice were infected intraluminally with an attenuated aroA aroC strain of S. typhi for 6 h or were left uninfected as controls, after which xenografts were harvested and mRNA for hBD-1 and hBD-2 from mucosal scrapings of the xenografts was amplified by RT-PCR. As shown in Fig. 4⇓, control xenografts and S. typhi-infected xenografts expressed mRNA for hBD-1, whereas the S. typhi-infected xenografts, but not the controls, also expressed hBD-2 mRNA. α- and β-defensin mRNA expression in Salmonella-infected human intestinal xenografts. RNA from uninfected control xenografts and S. typhi aroA aroC-infected human small-intestinal xenografts was amplified by RT-PCR for the β-defensins, hBD-1 and hBD-2; the α-defensins, HD-5 and HD-6; and β-actin. Human intestinal xenografts contain Paneth cells near the base of the crypts that, in normal human small intestine in vivo, are known to express the α-defensins HD-5 and HD-6 (1, 3, 4, 5). To assess whether Paneth cells in the xenografts also express HD-5 and HD-6 mRNA and whether expression of those defensins is up-regulated in response to bacterial infection, HD-5 and HD-6 mRNA from control and Salmonella-infected xenografts was amplified by RT-PCR. As shown in Fig. 4⇑, xenograft mucosa constitutively expressed mRNA for HD-5 and HD-6, and expression of these α-defensins was similar after Salmonella infection. 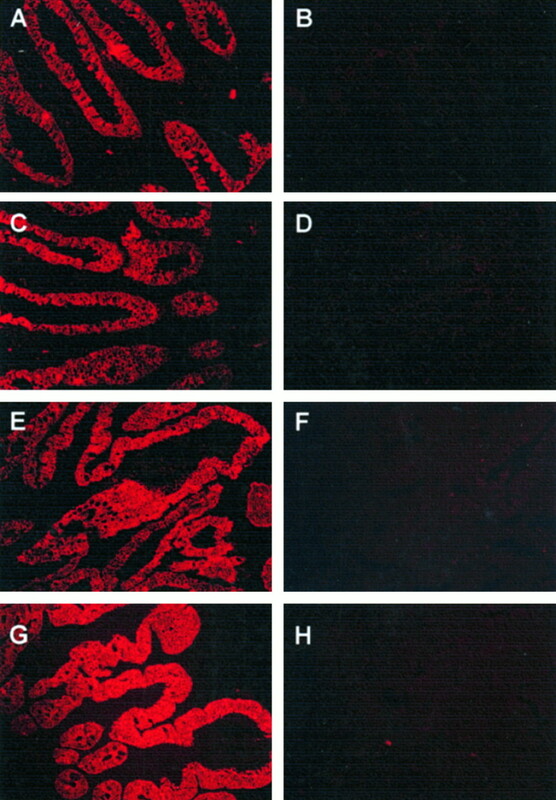 To determine whether the expression of hBD-1 and hBD-2 by human colon epithelial cell lines and fetal intestinal xenografts is representative of adult human intestine, frozen sections of human intestine were immunostained with polyclonal rabbit antisera to hBD-1 and hBD-2, using preimmunization sera from the same rabbits as a control. As shown in Fig. 5⇓, hBD-1 was equally expressed by the epithelium of uninflamed healthy colon (Fig. 5⇓A) and inflamed colon obtained at surgery from a patient with ulcerative colitis (Fig. 5⇓C). hBD-1 was also equally expressed by the epithelium of normal (Fig. 5⇓E) and inflamed duodenal mucosa (Fig. 5⇓G) obtained at the time of endoscopy from a patient with acid-peptic disease. hBD-1 immunostaining was present in both surface and crypt epithelial cells of the colon and in villous and crypt cells of the small intestine. As shown in Fig. 6⇓, there was little to no expression of hBD-2 by the epithelium of uninflamed colon (Fig. 6⇓A), but hBD-2 was expressed by surface and crypt cells in the epithelium of inflamed colon (Fig. 6⇓, C and E). Immunohistochemical detection of hBD-1 expression in human colon and small intestine. Human colon and small-intestinal tissue was analyzed by immunohistochemistry for hBD-1 expression. Uninflamed normal colon (A and B) and small intestine (E and F) as well as inflamed colon tissue obtained at surgery from an ulcerative colitis patient (C and D) and inflamed duodenal tissue obtained from a patient with acid-peptic disease (G and H) was examined. The sections shown in A, C, E, and G were immunostained with an hBD-1-specific antiserum. Adjacent sections (B, D, F, and H) were stained with matched preimmune serum. hBD-1 was expressed in surface and crypt epithelium in uninflamed and inflamed colon and in crypt and villous cells in uninflamed and inflamed small intestine. All sections are shown at a magnification of ×200. Similar results were noted in inflamed and uninflamed tissue from three additional patients. Immunohistochemical detection of hBD-2 expression in human colon. Human colon was analyzed by immunohistochemistry for hBD-2 expression. Uninflamed normal colon tissue (A and B) and inflamed colon tissue obtained at surgery from two patients with ulcerative colitis (C and D, E and F) was examined. The sections shown in A, C, and E were immunostained with an hBD-2-specific antiserum. Adjacent sections (B, D, and F) were stained with matched preimmune serum. hBD-2 was only expressed in surface and crypt epithelium of inflamed colon. All sections are shown at a magnification of ×200. Similar results were noted in inflamed and uninflamed colon tissue from three additional patients. We have demonstrated the constitutive and regulated expression of β-defensins by crypt, surface, and villous epithelial cells throughout the small intestine and colon. The distribution of the β-defensins contrasts with that of α-defensins, of which the expression in the human intestine is restricted to Paneth cells in the crypts of the small bowel (1, 3, 4, 5). Consistent with β-defensin expression in respiratory and gingival epithelia and in the skin, the expression of intestinal epithelial hBD-1 and hBD-2 is differentially regulated. Our findings suggest that enteric β-defensins are integral components of constitutive and regulated innate host defense. hBD-2 was expressed by intestinal epithelial cells in response to IL-1α stimulation or bacterial infection and by the epithelium of inflamed colonic mucosa in vivo. The up-regulated expression of hBD-2 in intestinal epithelium in response to mucosal inflammation is similar to that noted in several other tissues. For example, hBD-2 peptide was not detected in bronchoalveolar lavage fluid from normal individuals but was present in the fluid from patients with pneumonia, cystic fibrosis, or inflammatory lung disease (12, 18, 19). In epidermal tissue, hBD-2 was only expressed in sites surrounding areas of inflammation, whereas adjacent, noninflamed regions did not express hBD-2 protein (17). Similarly, hBD-2 mRNA was only significantly expressed in inflamed gingival epithelial tissue (15). Our data identify IL-1α as a major agonist for hBD-2 induction in intestinal epithelial cell lines. Consistent with this finding, expression of hBD-2 mRNA and protein in cultured tracheal epithelial cells (12), and hBD-2 mRNA expression in gingival keratinocytes was induced following IL-1 stimulation (15). The proximal promoter of hBD-2 has consensus NF-κB binding sites, and activation of NF-κB appears to be necessary for optimal hBD-2 gene expression in human colon epithelial cell lines. Consistent with a role of NF-κB, blocking NF-κB activation with a proteasome inhibitor, MG-132, or a mutant IκBα that acts as a superrepressor of NF-κB activation, abrogated IL-1α and bacterially induced expression of hBD-2. Nonetheless, activation of NF-κB does not appear to be sufficient for high level hBD-2 expression, as TNF-α was a weak inducer of hBD-2, although it maximally activated NF-κB and the expression of other NF-κB target genes (e.g., IL-8 and ICAM-1) in the same cells (data not shown) in which there was little, if any, induction of hBD-2. This finding indicates that transcriptional regulation of hBD-2 differs from that of several other intestinal epithelial cell NF-κB target genes. The six isoforms of hBD-1 identified in urine differ by truncations at the amino terminus and range in length from 36 to 47 aa (13). These hBD-1 isoforms vary in microbicidal activity, and there are significant interindividual variations in the relative proportions of the isoforms present in urine (13). Nonetheless, two hBD-1 isoforms of 44 and 40 aa predominate. Immunoblot analysis revealed that two isoforms of hBD-1, ∼47 and 44 aa in length, were produced by Caco-2 cells. However, it is possible that additional forms of enteric hBD-1 may be generated intraluminally by N-terminal processing in vivo. hBD-1 was constitutively expressed by colon epithelial cell lines, intestinal xenograft tissue, and adult human colon tissue. Nonetheless, increased release of hBD-1 peptide was observed in some experiments following IL-1α stimulation of Caco-2 cells. This indicates that IL-1α can increase translation and/or release of hBD-1 peptide into the extracellular environment, but whether parallel events occur in vivo is not known. Bronchoalveolar lavage fluid and airway surface fluid from cultured airway epithelia contains a 41-aa isoform of hBD-2 (12, 18). The same hBD-2 isoform was identified in saliva (15). In contrast, the hBD-2 peptide produced by IL-1α-stimulated Caco-2 cells migrated slower than a 41-aa hBD-2 peptide standard, suggesting a larger isoform. This peptide may be a precursor of the 41-aa variant that, under physiological conditions, may be subjected to N-terminal processing to yield a shorter peptide(s), just as the 47-aa hBD-1 is cleaved to yield a range of shorter isoforms of hBD-1 (13). As processing conditions at each mucosal site could be distinct in vivo, there may be differences in cleavage of epithelial cell-derived peptides, particularly between luminal environments as different as the lung and intestine. Further, it is possible that N-terminal variations may result in differences in peptide stability and microbicidal activity within different microenvironments. LPS did not induce the expression of hBD-2 in colon epithelial cell lines. However, LPS has been shown to induce hBD-2 in other mucosal tissues, namely gingival and epidermal keratinocytes (8, 15), suggesting that there are differences in the regulation of β-defensin expression among mucosal sites. In bovines, both LPS and TNF-α up-regulated tracheal antimicrobial peptide and lingual antimicrobial peptide mRNA expression by cultured tracheal epithelial cells (20, 22, 23). DefB1 or mBD-1 and Defb2/mBD-3 are murine homologues of hBD-1 and hBD-2, respectively (24, 25, 41, 42). In respiratory epithelia in vivo, Defb1/mBD-1 expression is constitutive (41, 42), whereas expression of Defb2 and mBD-3 mRNA is induced following infection with Pseudomonas aeruginosa or following LPS stimulation (24, 25). Differences in β-defensin regulation between different sites and species may reflect the adaptation of epithelial cells to the microenvironment in which the β-defensins function as components of host defense. Thus, the failure of LPS to induce hBD-2 expression in intestinal epithelial cell lines may reflect an adaptation of the intestinal epithelial cells to the high levels of bacterial LPS that are normally present in the human colon compared with the lower levels in the oral mucosa and airway epithelium. Alternatively, there may be differences in the LPS responsiveness of the cell lines compared with intestinal epithelium in vivo. The genes encoding hBD-1 and hBD-2 have 39% identity and appear to have evolved by duplication of a single ancestral gene (16, 17). Our data suggest that the products of these genes occupy distinct functional niches with the NF-κB consensus sequence distinguishing an inducible (hBD-2) from a constitutive (hBD-1) form of intestinal epithelial peptide antibiotic. Constitutively expressed hBD-1 could mediate epithelial interactions with the commensal flora, whereas hBD-2 may participate in the host defense response to enteric microbes that can breach the epithelial barrier. The discovery of structurally and functionally homologous forms of constitutive and inducible epithelial β-defensins in the mouse (24, 25, 41, 42) may allow these important issues to be tested in the context of an animal model. hBD-1 and hBD-2 have bactericidal activity against a spectrum of Gram-positive and Gram-negative enteric, urinary tract, and respiratory bacteria in vitro. However, we note that bactericidal activity of the β-defensins, like that of the α-defensins and cathelicidins in humans, is salt sensitive (1, 4, 11, 13, 18, 43, 44), and exact salt concentrations at the putative site of action of these peptides in vivo are not known. To the extent that these peptides act in microenvironments at the interface between the intestinal epithelial membrane, which has ion pumps and channels, and the intestinal lumen, regional variations in salt concentrations may be present and ultimately determine the in vivo microbicidal activity of the intestinal epithelial cell β-defensins. We thank John Leopard and Jennifer Smith for expert technical assistance and Erika Valore and Lide Liu for providing recombinant β-defensins, antisera to hBD-1, and hBD-2, and technical advice. We are grateful to Dr. N. Varki for providing human colon tissue for these studies and Dr. T. Savidge for providing tissue from human small-intestinal xenografts. ↵1 This work was supported by National Institutes of Health Grant DK35108. ↵2 Current address: La Jolla Institute for Allergy and Immunology, San Diego, CA 92121. ↵4 Abbreviations used in this paper: HD, human defensin; rh, recombinant human; TPA, 12-O-tetradecanoylphorbol-13-acetate; MOI, multiplicity of infection; mBD, murine β-defensin. Huttner, K. M., C. A. Kozak, and C. L. Bevins. The mouse genome encodes a single homolog of the antimicrobial human peptide β-defensin 1. FEBS Lett. 413:45.